Thursday June 13 1907 I was busy with work all forenoon I got a [illegible] [illegible] of straw-berries today. Dorothy and Hattie were out for the afternoon. I had a letter from Lydia she says for Aunt Jane and sone Willie are coming there for a visit. The boys busy plowing corn. 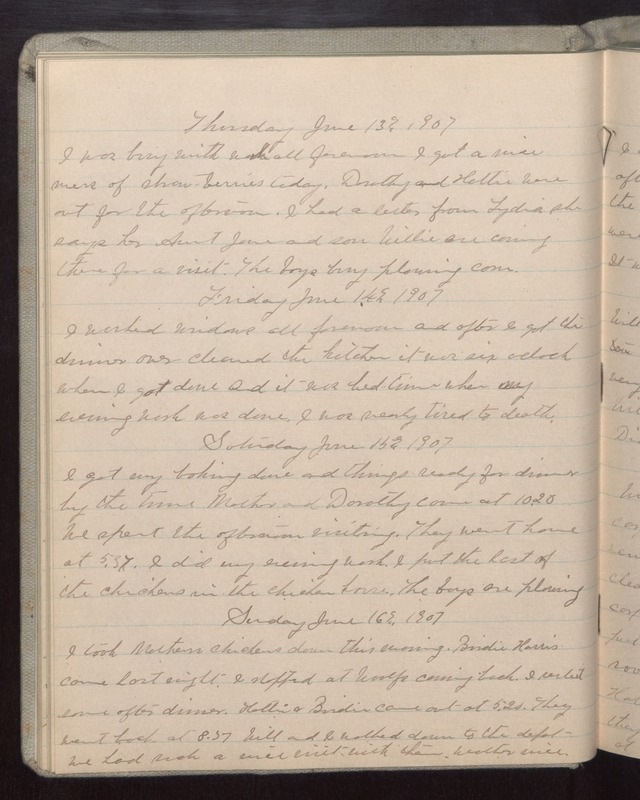 Friday June 14 1907 I washed windows all forenoon and after I got the dinner over cleaned the kitchen it was six oclock when I got done and it was bed-time when my evening work was done. I was nearly tired to death. Saturday June 15 1907 I gor my baking donw and things ready for dinner by the time Mother and Dorothy came out at 10.20 We spent the afternoon visiting. They went home at 5.37. I did my evening work. I put the last of the chickens in the chicken house. The boys are plowing. Sunday June 16 1907 I took Mothers chickens down this morning. Birdie Harris came last night. I stopped at Woolfs coming back. I [illegible] some after dinner. Hattie & Birdie came out at 5.20. They went back at 8.37 Will and I walked down to the depot We had such a nice visit with them. Weather nice.